Heat oven to 350°F. Grease 12 jumbo muffin cups with shortening or cooking spray, or place jumbo paper baking cup in each muffin cup. Make cake batter as directed on box. Divide batter evenly among muffin cups, filling each half full. Bake 20 to 30 minutes or until toothpick inserted in center comes out clean. Cool in pan 10 minutes; remove from pan to cooling rack. Cool completely, about 20 minutes. Frost cooled cupcakes with frosting. Place coconut in small bowl; stir in 2 to 3 drops green food color. Place about 2 tablespoons green coconut on each cupcake, making a nest. To make bunnies: Cut large marshmallow in half with kitchen scissors (dip scissors into water before each cut to minimize sticking). On cut side of marshmallow, place candy decorations for eyes, nose and whiskers. On other half of unused marshmallow, cut along top edge of marshmallow, creating a wedge. This will be one ear. Repeat for other ear. Sprinkle with pink sugar. Stick ears on top of bunny head with frosting. Place bunny on coconut nest. Place 2 miniature marshmallows in front of bunny for paws, and one behind for tail, using frosting to adhere. 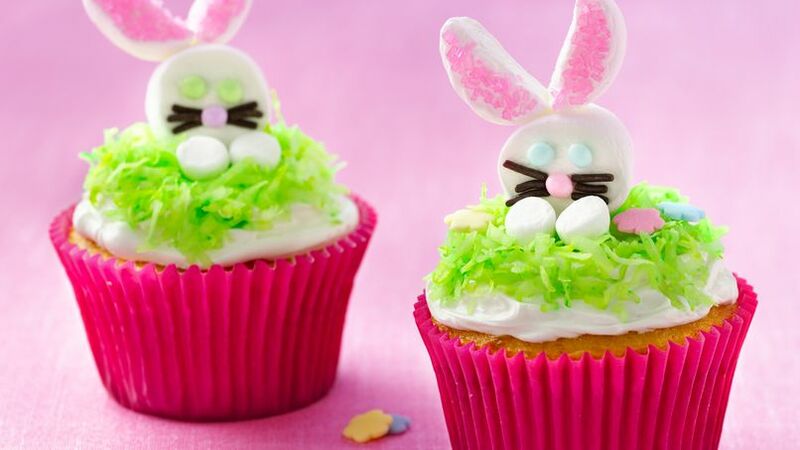 Enjoy these bunny cupcakes with your family. Get creative with these Easter desserts!